Brian Moy, Owner of Shōjō "The huge influx of food trucks. It's about time Boston caught up. It's such a conservative city that to [see people] think outside the traditional box of food service was surprising. Carolyn Johnson, Chef at 80 Thoreau "Guests begging me to serve goat meat! Casey Carney, Beverage Director at Capiz Lounge "Housemade syrups & bitters made a comeback! These weren't a big hit a year or two ago, but they kept popping up on drink lists wherever I was going. There are some pretty sick concoctions out there now. Johna Willis, General Manager at Towne Stove and Spirits "Ramen. 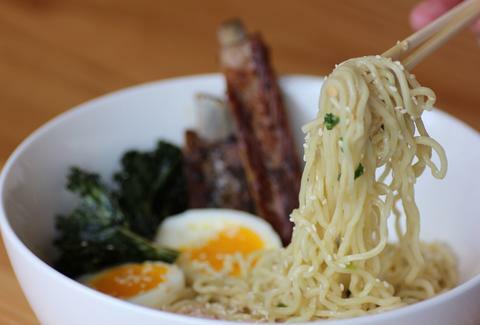 I read an article in Lucky Peach about David Chang's quest for ramen and all of a sudden, everyone was screaming 'ramen!'" Hadley Douglas, Owner of The Urban Grape "We were really surprised that Locke-Ober closed so quickly. I guess we all knew it wasn’t doing that well, and that it never really found its stride, but we also never thought it would close so unceremoniously. We hope for a glorious resurrection in 2013." Dave Becker, Owner of Sweet Basil "That any restaurant is still willing to do a Groupon. If you are only full when you do a deal, just lower your prices. Chuck Barbato, Director of Operations at Salvatore’s Restaurants "The Food Truck movement. It didn’t really sneak up on us, but we were surprised Boston embraced it as much as they did. Dustin Rennells, Instructor at the BCAE/Owner of Bad Boy Bake Shop "Happy's in Fenway. Where did this place come from? The wait staff is what really sells it. They're cool, but a little extra sassy, like an old diner waitress, 'Roxy.' And the drinks are top notch as well... are adult milkshakes becoming all the rage in the city? How haven't we been liquoring up our shakes, malts, and frappes all this time!? Erwin Ramos, Executive Chef at Ole Mexican Grill "Mexican cuisine in New England has finally taken a new culinary direction. This extremely diverse, light and fresh, deep and complex cuisine is shining... and there is still so much more to explore from every region of Mexico."